Location: Dryanovo is situated 270 metres above the sea level, at the foothills of the Central Balkan Mountains. It is amphitheatrically built on both sides of Dryanovska River. 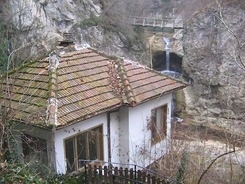 The town is located 21 km north west of Gabrovo and 220 km from the capital city Sofia. It is famous for its healthy climate and the unique nature and fresh mountain air. What to See: Very interesting landmark is Kolyo Ficheto Museum, which presents the lifework and the collections of one of the most prominent master builders of the National revival period. Among the works of the builder are the three-nave “St. Nicholas” Church and the old-time bridge of Dryanovo. Another worth to be visited landmark is Drayanovska Charshiya. It represents a marketplace, where a variety of revival period houses with workshops are situated. The Holy Trinity Church,, the clock tower and the Art Gallery are preserved in the complex. Vicinities: Dryanovo Monastery “St. Archangel Mihail” is situated 4 km from Dryanovo and 32 km from Veliko Tarnovo, in the gorge of Dryanovska River. It was founded in the 12th century and represents a spiritual bastion of the Bulgarians long ago. An exhibition “Dryanovo Monastery – a Centre of Bulgarian Spirit” has been arranged in a separate building, next to the Monastery entrance. 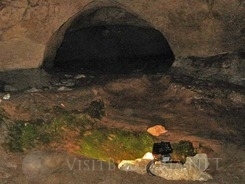 Bacho Kiro Cave is located west of the Monastery, just 5 min by walk. Back in the ages the cave was cut by the waters of t he river. The cave is a tempting labyrinth with a total length of the galleries of about 2 400 m. Bones of cave bear and an ancient man, pottery and tools of labour were found in the cave. Dryanovo Eco Trail passes from there as well.